While I was cleaning out some files I happened to run across these two labels for a local establishment. F.W. Kayser owned and operated a saloon in the old Armory Hall building here in Downieville. The flood of 1937 destroyed quite a few of the historical buildings here in town including the Armory building. The old armory building, in it's prime, boosted a roller skating rink, livery stable, the Fritz Kayser saloon, a meeting hall and a grocery store. 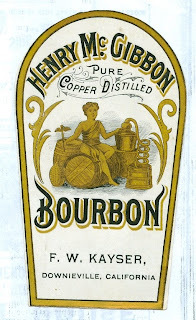 I have yet to see an embossed bottle from the town of Downieville and these paper labels were probably pasted on bottles that were re-cycled and filled in the back room of Fritz's saloon. I have no idea if ol' Fritz was filling these labeled bottles from a bulk product he purchased or if he was making his rum and bourbon out back in a horse trough. 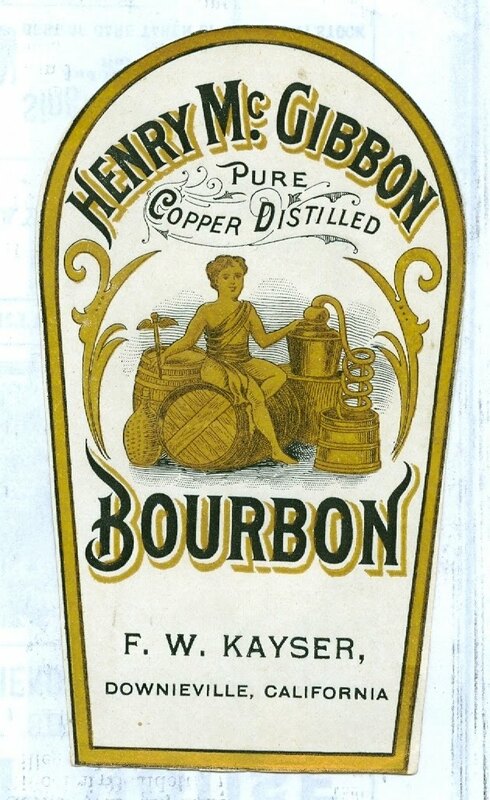 I like the claim "Pure Copper Distilled". Probably was, too, but in a copper kettle on the stove. Who can say for sure, though. Maybe 'ol Fritz had good whiskey freighted up to D-ville from somewhere else. No "brand name" would seem to make that possibility somewhat remote, eh? Attractive labels either way.